Microsoft Office 2013 is the latest version of the Microsoft Office productivity suite for Microsoft Windows PC. MS Office 2013 includes extended file format support, user interface updates, and support for touch, suitable for both 32bit and 64 bit Windows 8, Windows 7 or Windows Server 2008 R2. Several features are removed along of new features added in Microsoft office 2013, such as Clip Organizer, Picture Manager, chart styles, ability to insert a 3D cone, pyramid, or cylinder chart. In Microsoft Word 2013, custom XML markup has been removed for legal reasons and older WordArt objects are converted to new WordArt objects. Micrsoft offers 4 editions Office Suite 2013 including Microsoft Office 2013 Home & Student, Microsoft Office 2013 Office Home & business, Microsoft Office 2013 Office Professional, Microsoft Office 2013 Office Professional plus. The price just remain same as those of Micrsoft Office 2010. If you are disappointed with Microsoft Office 2013 for the ridiculous price, for slowness to load, or for whatever reason, you can download the best free Microsoft Office 2013 Alternative or professional Microsoft Office 2013 Replacement that is similar to MS Office 2013 and is highly compatible with MS Office 2013/2010/2007/2003 to replace Microsoft Office 2013. 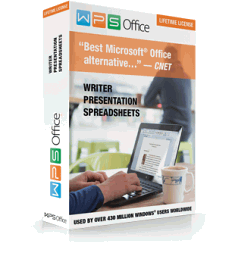 Kingsoft Office Suite Free 2012 offers the three classic programs Writer (functions as Word), Presentation (functions as PowerPoint) and Spreadsheet (functions as Excel) all at the cost of nothing. This suite is innovative in that its small size of 39MB adds little strain to your computer whilst delivering the core functions of word processing, multimedia presentation and data processing and analysis. Despite being free, Kingsoft Office remains a leader in providing an new and exciting features including: a paragraph adjustment tool, a multiple tabbed feature, and Office to PDF converter and automatic spell checking/word count functions. Free download Microsoft Office 2013 free alternative now! Kingsoft Office Suite professional 2012 is the best Microsoft Office 2013 alternative equipped with three state-of-the-art office programs: Writer (functions as Word), Presentation (functions as PowerPoint) and Spreadsheet (functions as Excel). The Microsoft Office 2013 replacement features as powerful as Micrsoft Office, fully compatible with Microsoft Office, as well as with unique highlights such as much smaller file size (only 55.15 MB), convert office documents into PDF formats, convert PowerPoint to Word document and much more. The word processor that can totally replace Microsoft Word 2013. Writer’s compatible formats to Micrsoft Office and ability to export PDFs make it stand out from other word processors. You can open, edit and export Microsoft Word files in Writer like using Miscrosoft! An alternative and replacement for Microsoft Excel 2013, Kingsoft Spreadsheets Professional 2012 includes a calculator, graphing tools, and multiple other tools for complex data analysis. Besides that, it also supports more than 100 commonly used formulas, and a plethora of functions to aid in data analysis. It can not only import and export .xls or .xlsx files, but also produce other file formats such as .et, .txt, .csv, .pdf, and .dbf. As the best Micrsoft PowerPoint 2013 Replacement on Windows, Presentation Professional creates top-notch presentations that equal Microsoft Power Point presentations. Impress can create PDF files and Flash files, and create, save or download presentation templates. It can not only import and export PowerPoint files,but also produce .dps and .pdf files. The Microsoft Office Replacement can open, view and edit Word/Excel/Powerpoint (97/2000/2003/2007/2010/2013) as well as export to Word/Excel/Powerpoint format.